Though time has come to let first the Khorasanis and later the Turks dominate Islamic martial society, Arabs retain a military importance especially amongst the Ayyubids, Abbasids and naturally the Omani for whom they make up the majority of their ranks. Yet for the former two dynasties it is largely Arabs of city and village and not the ancestral livelihood which marked the birth of their Islamic faith who fight for Sultan and Caliph./n/nMartial passions have not left the Bedouin of the desert, rather respect for their military skills have, yet for those powers neighboring the great deserts east of the Jordan river, south of Mesopotamia and east of coastal Syria, a respect has grown for those bedouin who use the reliable, enduring camel as a beast of war as well as of burden. 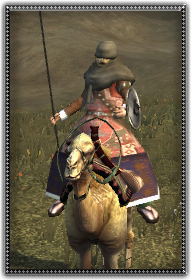 Despite misconception, the camel's accomplishments during the rise of Islamic hegemony were not truly that of a mounted beast in battle, but more a means of infantrymen and supplies to travel quickly through the desert. Never the less, these bedouin wielding bow and sword fight masterfully in their native desert.